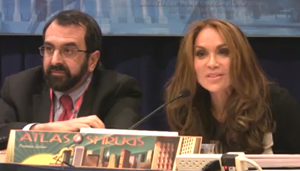 CPAC 2013 included some controversy, which resulted in the Breitbart.com team sponsoring a hastily organized session on Saturday afternoon that featured a panel of prominent thought leaders on the American Right who were “uninvited” by the CPAC board. This year CPAC excluded presentations by conservatives whose messages and missions concern the threat of radical Islam, jihadists, at home and abroad. Specifically, Robert Spencer (Jihad Watch), Pamela Geller (founder of Atlas Shrugs), Frank Gaffney (founder and principal of the Center for Security Policy), Nina Shea (Center for Religious Freedom) Dr. Daniel Goure (Lexington Institute), and other similar outspoken critics of radical Islam, were excluded. Others also uninvited for varying reasons included the GOProud organization, Virginia Governor Bob McDonnell, and New Jersey Governor Chris Christie. So there was no shortage of controversy. The Saturday afternoon Breitbart.com session gave some of these uninvited a voice. You can hear Spencer’s and Gellar’s remarks here. In addition, the added Breitbart session included Congressman Steve King who listed the subjects CPAC chose to limit or avoid entirely this year, among which were global jihad, jihad in America, persecution of Christians around the world, and the ongoing, unilateral, and dangerous denuclearization of America. To be fair to the CPAC board, there was a Thursday afternoon session entitled “Iran and the Islamist Threat to America and the West: What is—What Should Be—Our Strategy” which featured Senator Lindsey Graham, House Armed Services Committee Chair Congressman Buck McKeon, and three others connected with foundations. I heard most of it, and it concerned Iran particularly, which is of vital importance, but does not address the scope of the international problem of radical Islam, or the threats coming from groups on our own soil. At the Breitbart.com “uninvited” panel session, former U.S. Attorney General Michael Mukasey spoke about how important it is for us to recognize that while we Americans see religion as an important aspect of our lives, Islamists see it as their whole lives. Mukasey also stressed how profoundly incompatible sharia law is with the American system of government and religious freedoms. Peter Schweizer of the Government Accountability Institute addressed the modern version of what he called “crony capitalism” which he described as the use of the free markets to bring socialist ends. His examples were both the boondoggle funding of numerous green energy failed start-ups and also the bailouts of auto industries and other formerly private sector businesses. Schweizer echoed the sentiment heard elsewhere during CPAC, that conservatives need to be pro-free markets, not necessarily pro-business, as that latter term can be co-opted to support bailouts and growing government intrusion into and control over the private sector, which is a step along the path to socialism. One compelling point echoed in the remarks of many of these “uninvited” presenters was that the political right does not normally shut out viewpoints or speakers. Liberals do that. College campuses are hotbeds of liberalism precisely because they give lip service to the value of diversity of opinion but in practice and reality almost exclusively espouse and expose students to the views of the American Left. A schism of sorts exists on the American right about many issues, (and equally on the American left). And CPAC is certainly entitled to pick and choose speakers and topics. But to exclude speakers who are internationally known experts on Islamic global jihad, and on the development of jihad-supporting organizations on American soil, a subject of obvious immense importance, seems shortsighted. Conservatives, those on the American Right, are the only possible source of information within American political and policy circles, about the threat posed by radical Islam. Whatever behind the scenes pressures, fears or disputes caused CPAC to carve out these threats from the full plate of conservative issues needs to be resolved.